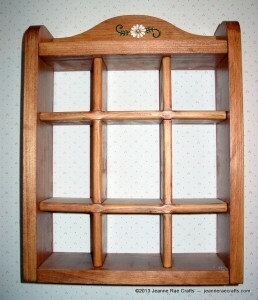 The top opens to a large, flat surface to give the customer an area to write. 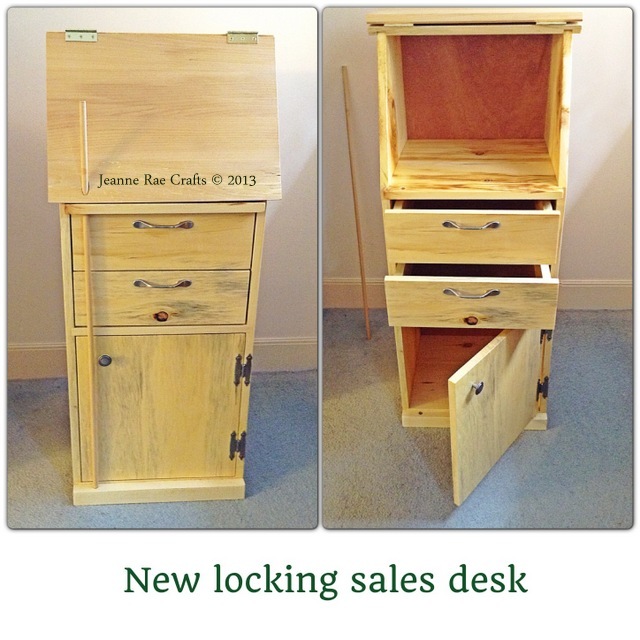 That top compartment is perfect for the cashbox. 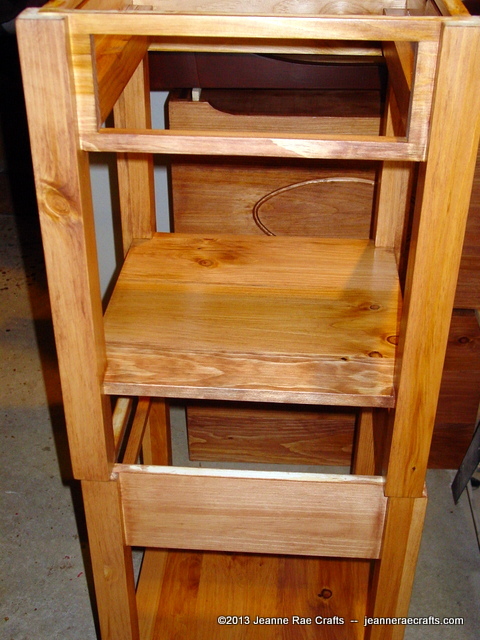 Drawers hold other essentials and the bottom cabinet is a handy cubbyhole. And to top it all, he’s made it locking! 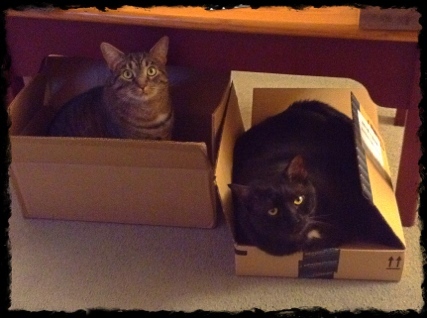 So much better than perching things on cardboard boxes, wouldn’t you say?! What’s in the Works Wednesday? Bill tells me these tables are the best he’s ever made. Probably both tables will come to me next for a bit of decorative painting. 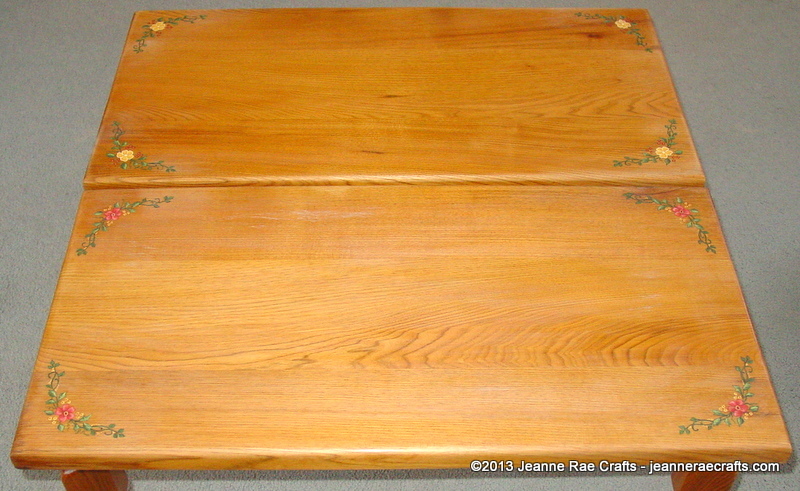 I think this cherry table is just drop-dead gorgeous! 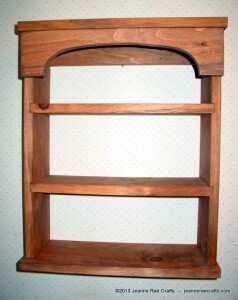 We’ll be exhibiting these first at the Vermont Maple Festival in St. Albans, VT, April 26-28. Stop by to see all of our hard work! They are all done! 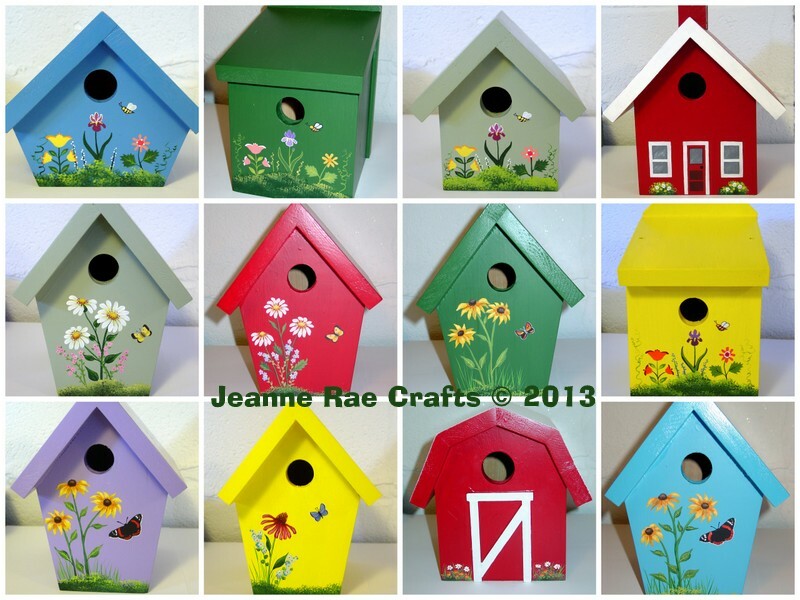 If you find your birds are in need of housing, check out our birdhouse page. If you don’t see what you want there, feel free to email or call us (information is at the bottom of this page). Best of all, they are the only thing “blooming” in my garden right now! Summer squash, yellow and green beans, pumpkins, carrots, radishes, tomatoes, peas, cucumbers, green peppers, here I go. 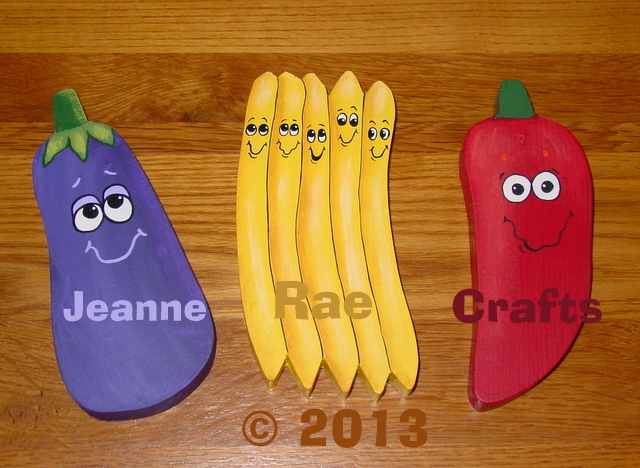 New this year: chili peppers and eggplant. Ahhh, spring – it’ll be here before you know it! Bill has been all excited about finishing his next unique project, so much so that he took these pictures himself. At first glance, it’s just a nice little table. Check out the side view, taking special note of the wooden pins. 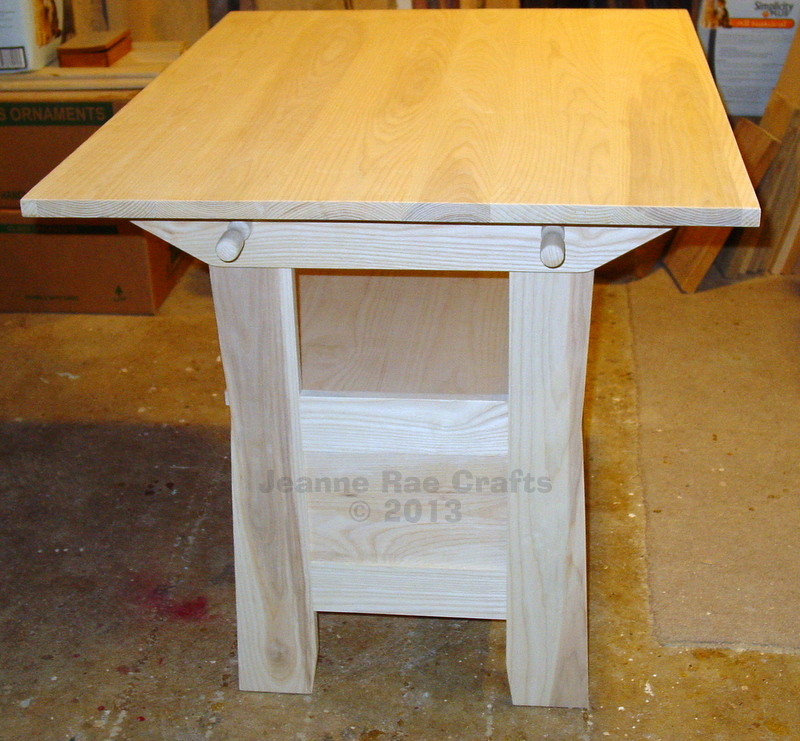 Side view of the table. Take note of the wood pins. 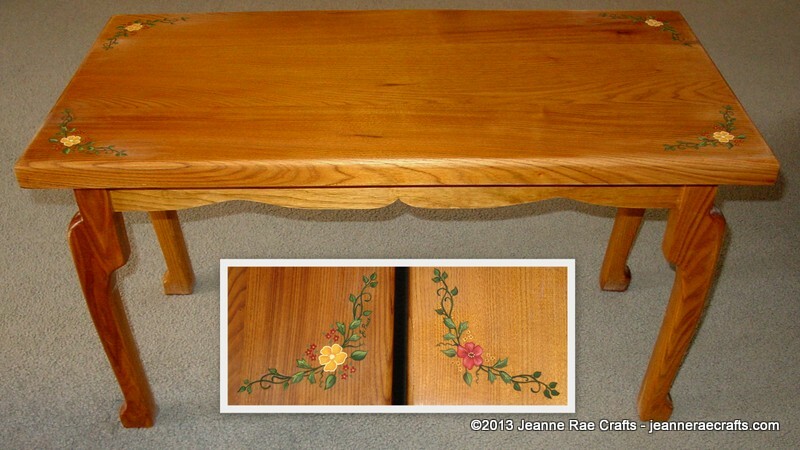 Pull out 2 pins…and you have yourself a handy dandy table bench! And you have storage! How handy is that? 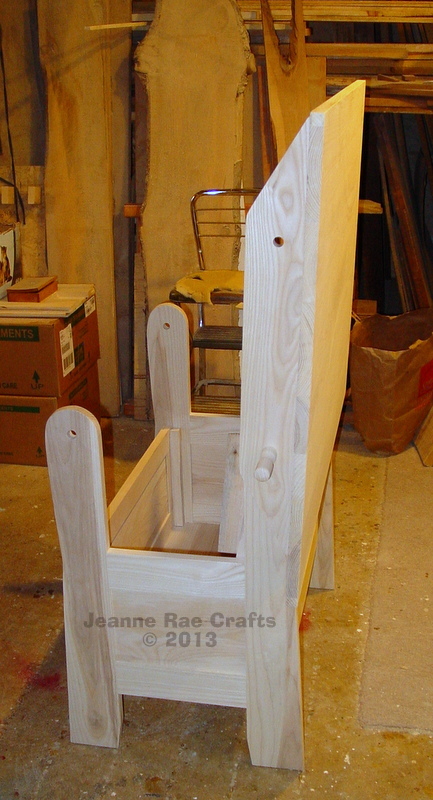 This unique piece of furniture is called a settle table bench with storage. The wood is ash and will have a golden oak stain. Stay tuned to see how stunning this unusual piece turns out. Oh my! This is the fifth Wednesday in a row that I’m posting birdhouses. I promise this will be the last! This time it’s chalets, barns, and yet-to-be-named shape. I also should mention that each birdhouse is made from cedar, has a clean-out and ventilation, finished with exterior paint, and exterior varnish over the painting. They are fully functional birdhouses meant to go outdoors. I’m having fun painting these little flower vignettes, with a different butterfly for each different flower. So far, the flowers are purple coneflower, ox-eye daisy, and black-eyed susan; the butterflies are spring azure, yellow sulphur, American copper and red admiral. Most people don’t really care exactly what they are but I just like to know. 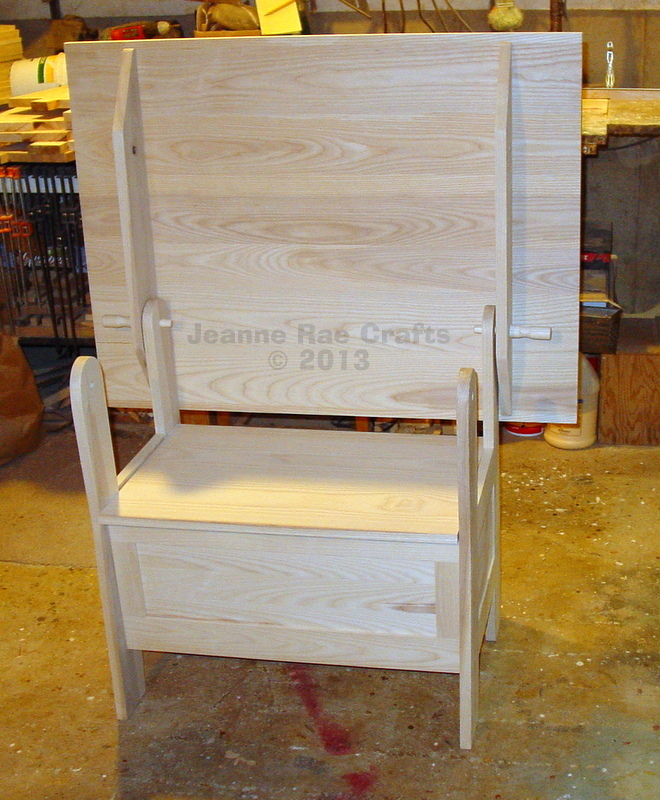 Next week, it will be on to garden markers, and oh, so many pieces of furniture. Here’s to a productive week! 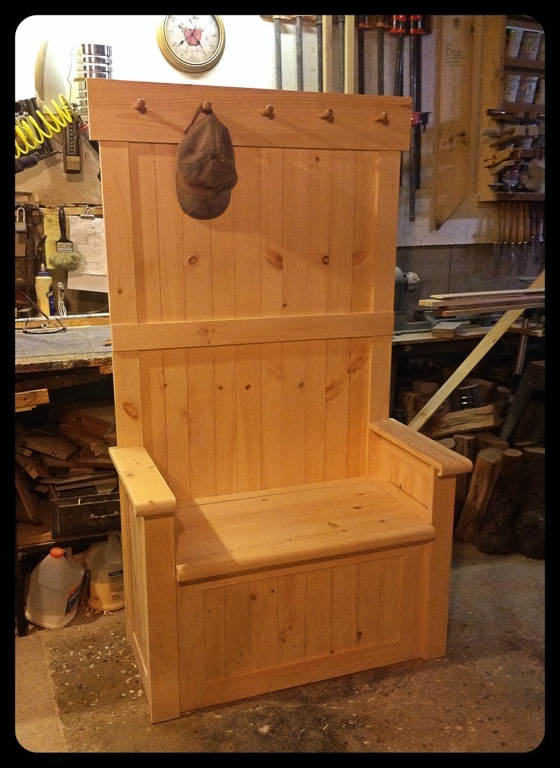 On any given day, chances are good that Bill is designing some new piece of furniture. This coffee table is the first radically new design for 2013. I’m loving it, he not so much. We would love to hear your thoughts, too. 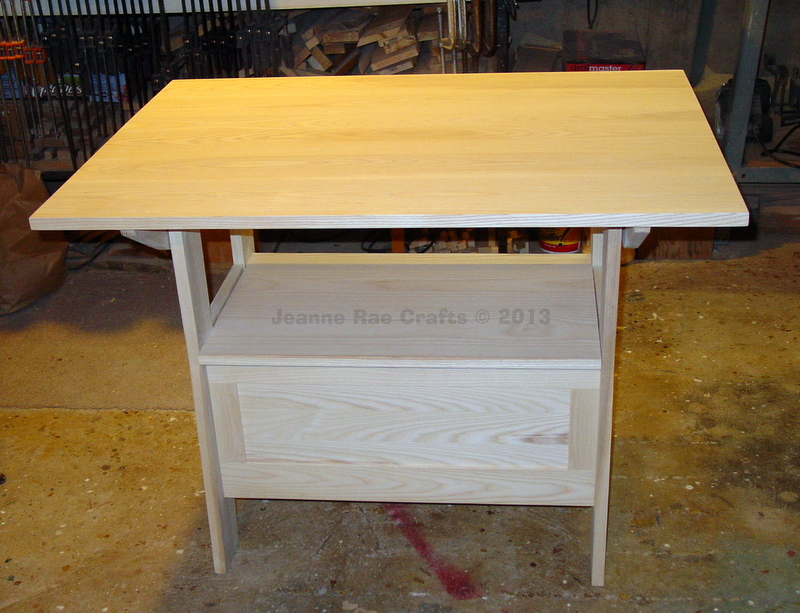 …on 34 pieces of furniture as well as table tops and drawer fronts! But I’m still up to my eyeballs in birdhouses and little bird feeders. Over 70 done so far, with another 2 dozen to go. In between times, I’m painting ornaments, also. Next week (though I hope sooner) it’s on to garden row markers. 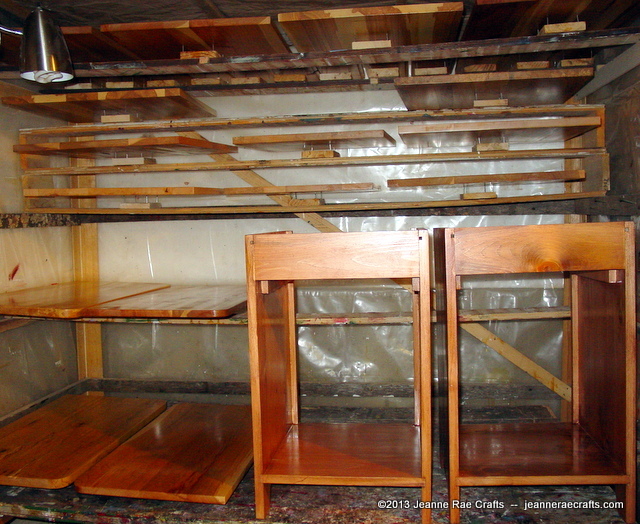 The challenge will be to finish before all those pieces of furniture come a knockin’! 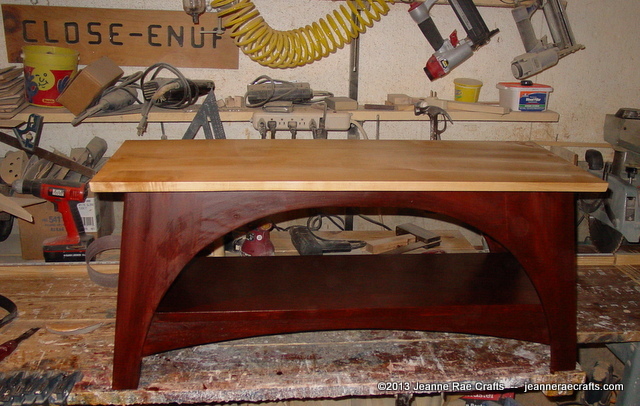 This time in the workshop, Bill’s putting a finish on a newly designed coffee table. I’m loving those curves! Can’t help but notice the “close-enuf” sign that his dad made him years ago. His dad would be pleased to see that Bill’s woodworking goals have moved wa-a-a-y beyond “close enuf” – right into craftsman! 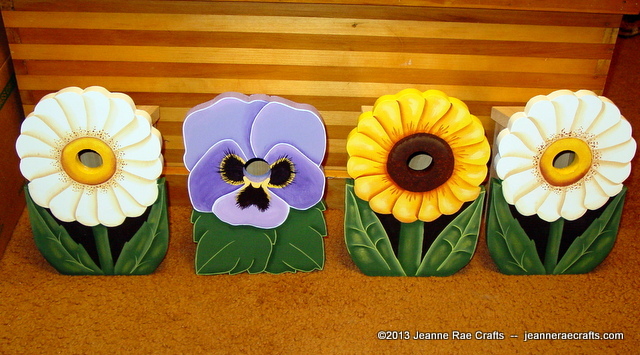 In the studio, all the flower birdhouses, pansies, daisies and sunflowers, are ready for the final coat of varnish. Coming up this week, more birdhouses – nuthatch, chickadee, wren, chalet, barn, and schoolhouse – as well as little bird feeders. 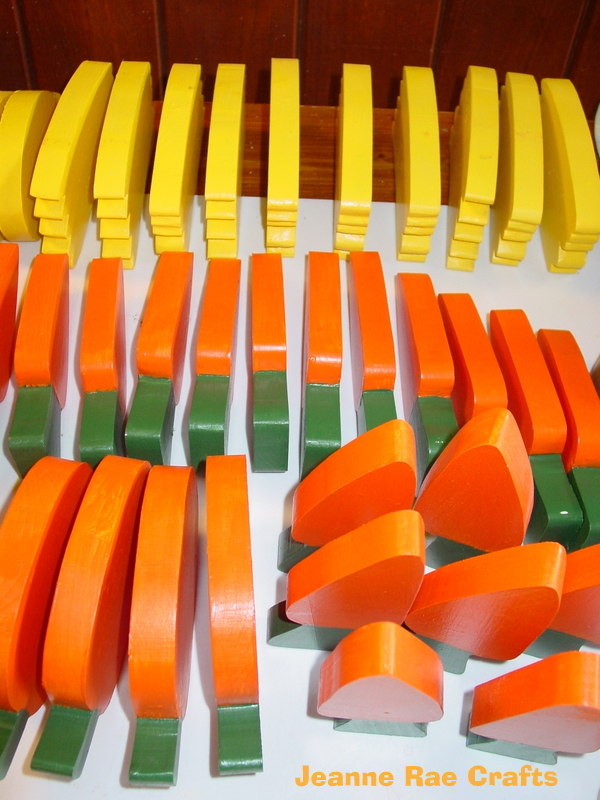 Little wooden items – they are my kind of thing. 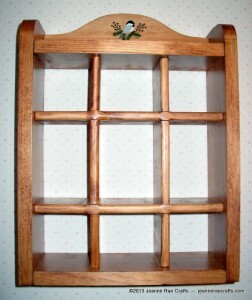 Bill came up with some new home accents, shadowbox shelves. One definition of accent is “to lay particular emphasis on.” These shadowboxes serve the purpose of emphasizing and highlighting some of your favorite things. The hand painting varies from these daisies to other flower designs and, of course, chickadees. 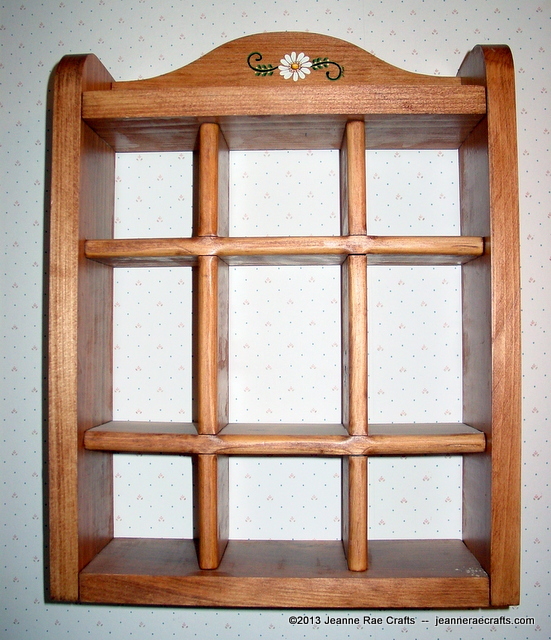 Fill these little gems with knickknacks or collections or treasures. 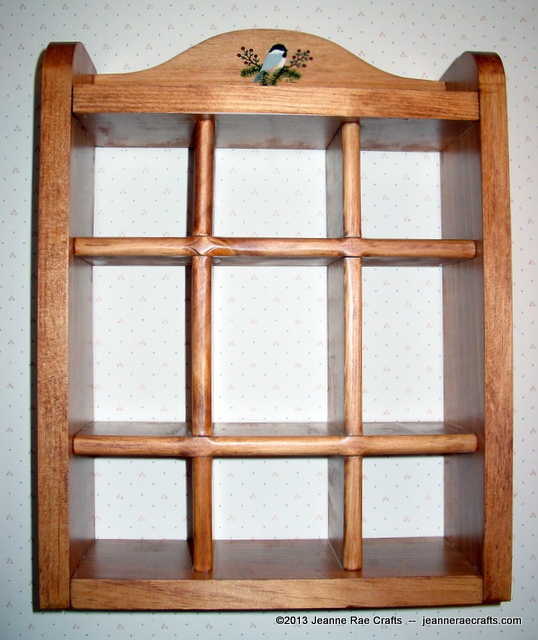 The medium shadowbox shelves are slightly bigger. There’s no hand painting right now but stay tuned this week to see what the muse inspires! So what about painting? I do it just about every day. (You can read more about this in “About Wildflower Wood” on the right sidebar.) 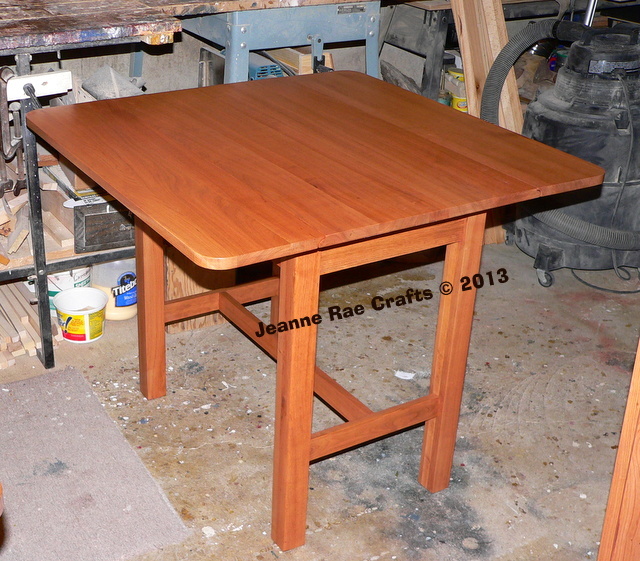 Today I finished two coffee table tops. Bill built these little beauties from native Vermont butternut. Painting on the wood is similar to choosing coordinating fabrics. Every variety of wood has its own color family. I started these designs with one color leaves but quickly realized it was the wrong green for the golden glow of butternut. 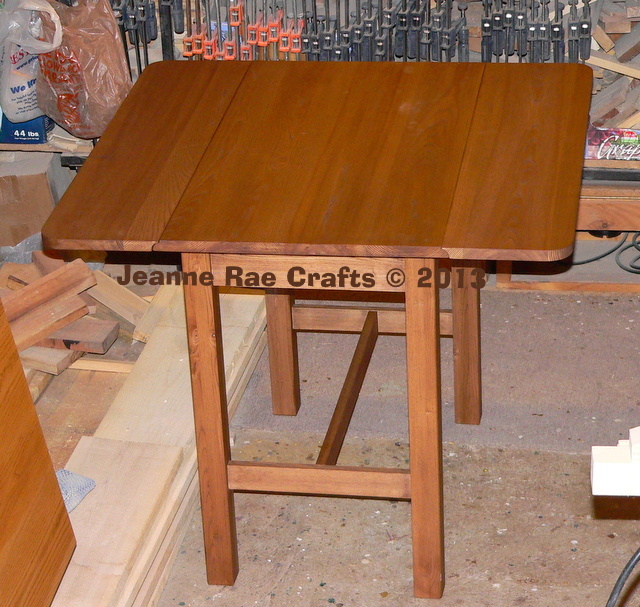 These tables now are back in Bill’s shop for the final coats of finish, spiffing them right up for our first fair. That first fair is in St. Albans, VT at the Vermont Maple Festival. In between times, I’m also painting ornaments. It’s Christmas all year in my household! 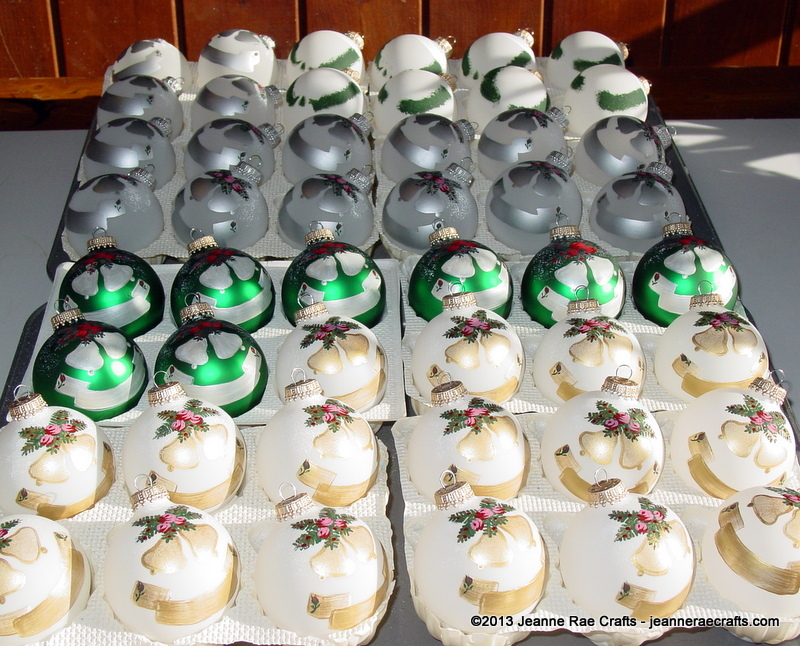 More about these ornaments later…time to get ready for tonight’s quilt guild meeting.